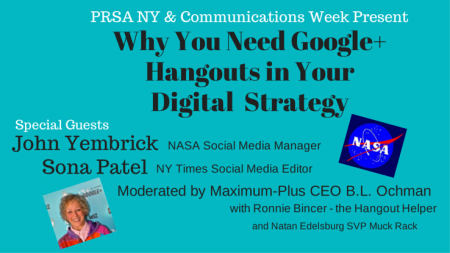 3- The Hangout will be recorded and available on the event page and on YouTube. ** I will time stamp the video so you will be able to jump directly to any segment by clicking on the corresponding time. Looking forward to seeing you all today! **If you’d like to discuss coaching for adding Hangouts to your organization’s digital strategy, or producing live online events, I can help. B.L. 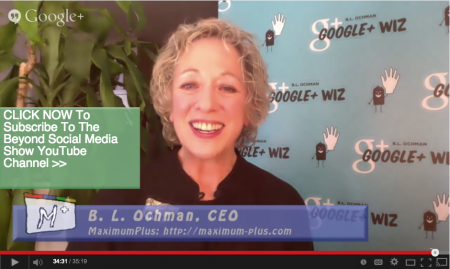 Ochman is CEO of Maximum-Plus.com – Events & Training for Google+ Success, serving leading brands, associations and agencies. 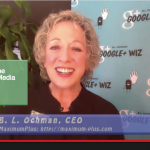 As a digital strategist, GooglePlus Helpouts coach, YouTube Channel Creator, President of whatsnextonline.com, and publisher of What’s Next Blog, she’s been helping blue chip companies incorporate new media into their marketing mix since 1996. B.L. contributes to Ad Age Digital Next, Social Media Today and others and has spoken at more than 25 marketing conferences. Follow B.L. on Google+ or Twitter.